On my last day in Kinabatangan, I decided to make the most of the time I had left and joined a morning river cruise. After a night spent on the river, 6 am start did seem like a cruel and unusual punishment, but the possibility of spotting an otter at the oxbow lake kept me motivated. As I stumbled to the jetty still half asleep I noticed that the captain was unusually excited. He had spotted an Orangutan. Just a couple of meters down the river a young female was lounging in a fork of a tree, munching on a fruit with a sleepy and slightly confused expression on her intelligent face. Crumbs of her breakfast were smeared all over her round belly, face and hands. She looked like I imagined I must have at this early hour. After such a promising start, the rest of the cruise was quite uninspiring and failed to produce any interesting wildlife what-so-ever. Luckily, I planned a trip to Gomantong cave for the day, which apart from the obvious attraction of the cave itself, is considered to be a good place to look for the Red Leaf monkeys. Unlike the secondary forest along the banks of Kinabatangan, Gomantong cave is surrounded by Borneo’s famed 140 million-year-old primary rainforest. 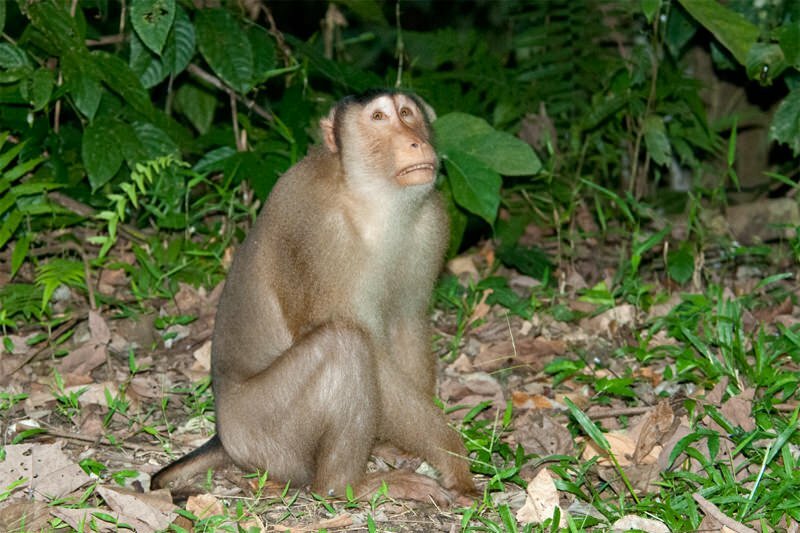 Within minutes of entering the protected area, we were seeing wildlife: a troop of Pig-tailed macaques, a brilliantly-green lizard, an eagle on the lookout for its next meal. 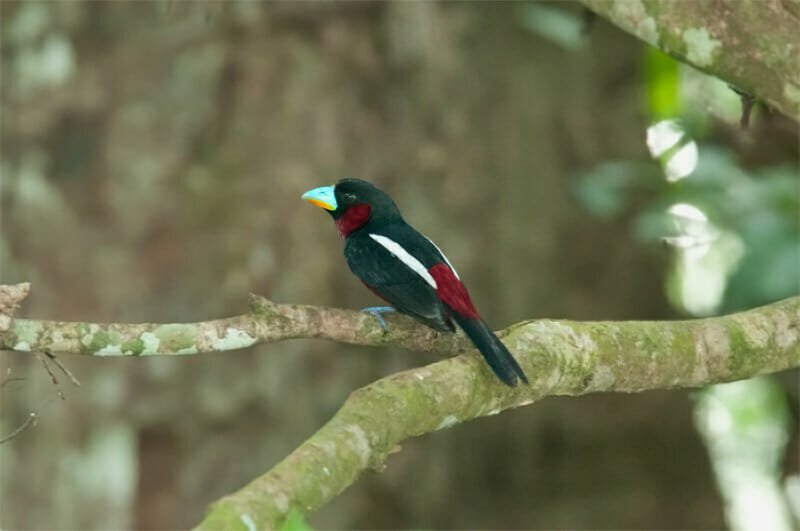 At the car park, while we were waiting for something, which seems to be the most popular pastime in Asia, Razmir called in a Black and Red Broadbill using a bird call app on his phone. He knew I wanted to see this bird ever since we unceremoniously flushed out a sleeping pair on the river during the hunt for Slow Loris. This time I had fantastic views of a couple of birds that flew in to defend their spot from an invisible intruder. 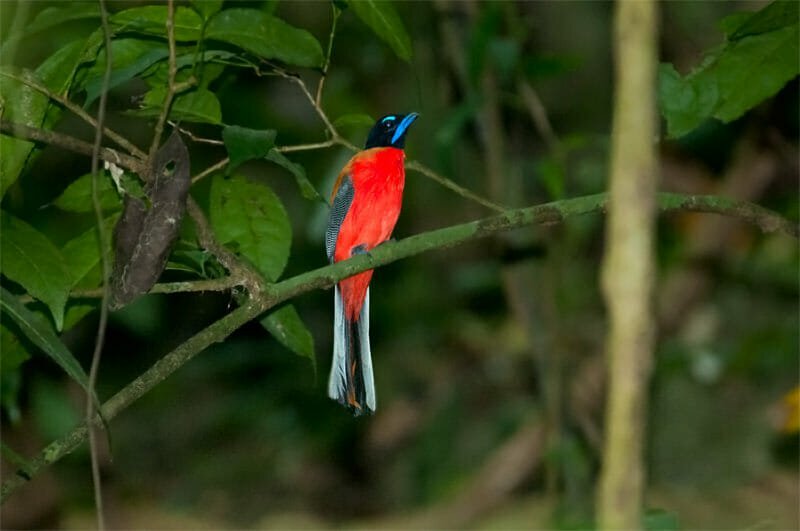 Following his success with broadbills, Razmir called in two vibrantly coloured trogons. This he did more for himself than for me. 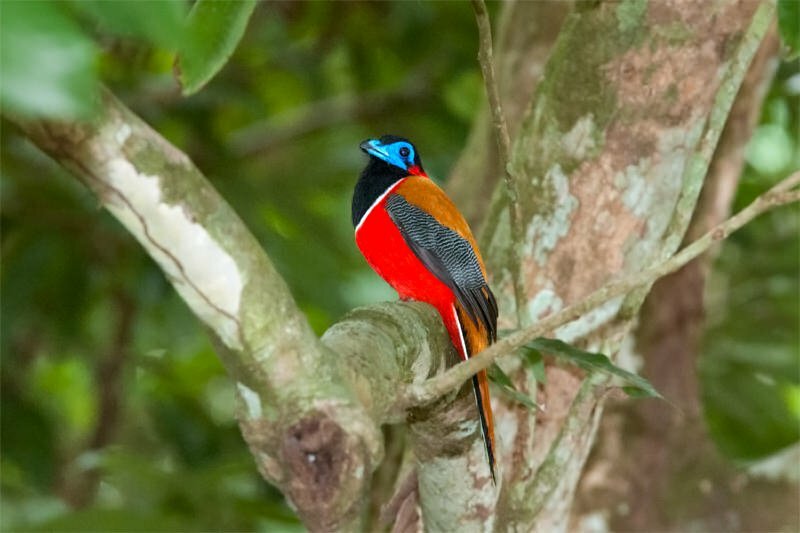 Red-naped trogon, in particular, is his favourite bird. It was heart-warming to watch a genuinely happy smile spread across his face and his eyes light up with excitement as he watched the bird. Wildlife tourism is an industry like any other and quite often, especially in third world countries, local people become guides simply because it is the best paying job available. Actually liking wildlife is not a requirement. But now and then I have met guides that were truly passionate about their craft and Razmir was clearly one of these rare people. From the car park, we walked into the ancient forest along an elevated wooden walkway. My first impression of Gomantong cave, famously depicted in David Attenborough’s Planet Earth, was disbelief. It was absolutely enormous. The entrance to the cave was a gaping black void carved by nature in the side of a mountain covered by a thick carpet of the lush green rainforest. As we walked across the threshold from daylight to almost total darkness my senses were assailed by a plethora of sensations. The stench of guano was almost unbearable. Rolling hills of excrement carpeted the cave floor. This is what you get in a cave inhabited by thousands of nesting birds and roosting bats. I am, however, no stranger to the smell of guano, so after the initial shock, I quickly grew accustomed to it. What I couldn’t get accustomed to was the living breathing blanket of light brown cockroaches that covered every surface in the cave and made it appear as if the walls and the floor were in constant sickening motion. The ceiling of the cave towered 60 meters above us and was covered with thousands upon thousands of swifts’ nests. This is where the cave’s fame comes from. The swifts nesting here build their cup-shaped nests entirely from their own saliva. It takes the pair of birds more than 30 days to produce the nest, and if the nest is removed the birds immediately start building a new one. Those nests are a prized commodity, and the main ingredient in the bird-nest soup, which is believed to increase longevity and vitality. Once a year the nests are harvested in a controlled and regulated manner, so the swift community continues to thrive. Among the swifts there were quite a number of bats – Acuminate Horseshoe, according to the information display at the visitor centre. The best way to see the bats, however, is at dusk when they emerge from the cave in their thousands. Since dusk was not for another hour we headed back to the car park where Razmir spotted the promised Red Leaf monkey that was relaxing on a tree branch half way up the mountain a couple of time zones away. While we were waiting for the bats to emerge an ominous-looking rain cloud crept over the car park and within minutes unleashed a torrential downpour. Everyone ran for the cars, but to me the cool reprieve of the rain was very welcome. I love tropical thunderstorms. Standing there in the pouring rain I felt like I was dissolving into the ancient landscape surrounding me. Like me, the bats were not deterred by the rain and I could see them fly across the darkening sky in undulating clouds that moved with mesmerizing synchronicity. Eventually, I decided that I was sufficiently saturated and returned to the car for the drive back to camp, where as it turned out, it hasn’t rained at all. As the evening dawned, it was time for my last night cruise on the mighty Kinabatangan – the last chance to spot a Flat-headed cat. Razmir and I walked down to the jetty and once we were out in the open, I looked up and for a moment the world had stopped spinning. There above the river the huge disk of the moon was glowing dark red in total eclipse. It looked alien, imposing and absolutely spectacular. I am always deeply touched by celestial events, but in the excitement of the chase after the cats I forgot about the eclipse yet I managed to stumble on it when the moon was at the point of greatest eclipse. The magic and mystique of the sight captured my attention so completely that everything else simply fell away. That moment felt so singularly unique and in all aspects perfect that I felt myself drift beyond the boundaries of limited human perception and touch something far greater than I could ever explain. The moon stayed ahead of us as we traveled down the river and when the captain turned the boat towards the bank to investigate an eye shine I glanced in the direction we had come from and my heart skipped a beat for the second time that night. Behind us in the dark moonless sky the band of the Milky Way arched above the river from one bank to the other, dark clouds of interstellar dust illuminated by millions upon millions of brilliant stars. I often wondered why more stars were not visible at night over the river. The answer seemed obvious now – the moon had been too bright. It’d been almost full since I arrived and its brightness obscured the stars. Razmir often commented that our nights were as bright as day. Tonight the sky was dark. As we meandered down the river our view alternated between the eclipsed moon and the bright band of the Milky Way as the river changed direction. This was by far the most spectacular sky I have ever experienced. I felt completely and utterly content. The civet didn’t wait for us to navigate the slippery bank and started walking away before I even raised my camera. I scanned the jungle with my torch and conveniently found another set of eyes glowing in the dark. 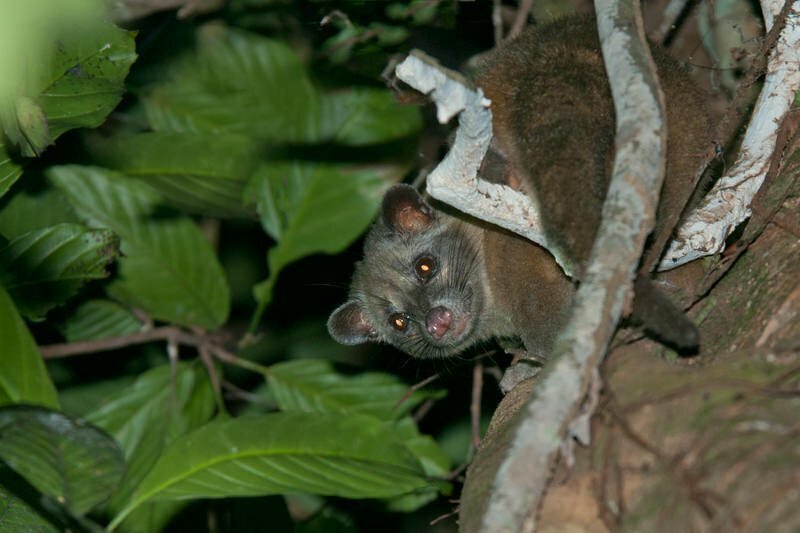 A Common palm civet. It started to move away, climbed up to a higher branch and then thought better of it. It must’ve felt safe enough. Again I was amazed at how unafraid the animals were in these parts. We continued down the river and soon spotted another civet on the bank. ‘Are we going for a walk?’ I asked getting to my feet. Razmir considered the condition of the mud and before he could answer the forest exploded with a burst of noise and movement. A giant crocodile was tearing through the undergrowth at an astonishing speed. Stupefied for a moment I felt a bit unsteady on my feet as I imagined us walking up to this monster. 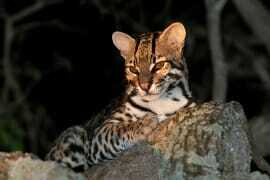 Well, at least we saved that civet’s life by disturbing its would-be killer. Another few hundred meters down the river Razmir spotted another civet. As usual the captain brought the boat to the bank and Razmir went to examine its condition. ‘Are we going for a walk?’ I asked my usual question. ‘No’, he said, ‘Don’t go. It’s the mud’. I stood on the bow of the boat and looked into the jungle. Just a few meters away from me a bright pair of mammalian eyes was staring back at me. ‘Must be Razmir’s civet’, was my first thought. We looked at each other. The reflected eye shine was so bright that I could barely distinguish the shape of the animal behind it. But suddenly I saw that it was not a civet at all. The realization hit me like a bolt of lightning – it’s the Flat-headed cat! I called out to Razmir to shine his spotlight on the animal so I could photograph it, but he was too distracted by planning our crossing over the mud. I looked back and watched the little cat slowly stand up, turn around and start walking away. My heart pounding against my chest and the equanimity totally forgotten, I launched myself off the boat swallowing a cry ‘it’s the cat!’ All this happened in a fraction of a moment, from me spotting the eye shine to jumping off the boat. The next few moments, in contrast unfolded as if in slow motion. As I landed on the bank my feet instantly sunk into the slimy gooey mass half way up to my knees. With a determined effort I pulled one leg out, took a step and sank back into the mud. As I pulled my other leg out, it came out without a shoe. By sheer force of will I made it onto the firmer ground and took off after the cat, wearing one shoe, one sock and a few kilograms of mud plastered to my jeans. Conflicting emotions of overwhelming excitement of a dream fulfilled and bitter disappointment of not catching it on camera were tearing me apart. I darted through the undergrowth trying to follow the cat that was obviously no longer there. At length the excitement won and I returned to the boat, thrilled at having seen the cat. As we continued to travel down the river I let it all sink in: I have just seen a Flat-headed cat – a vanishing species, so rare and so incredibly unique. I caught a glimpse of a moment in its life as it went about its day unconcerned with the world beyond the river. It felt like such a privilege – I have won one round of the race against the clock. 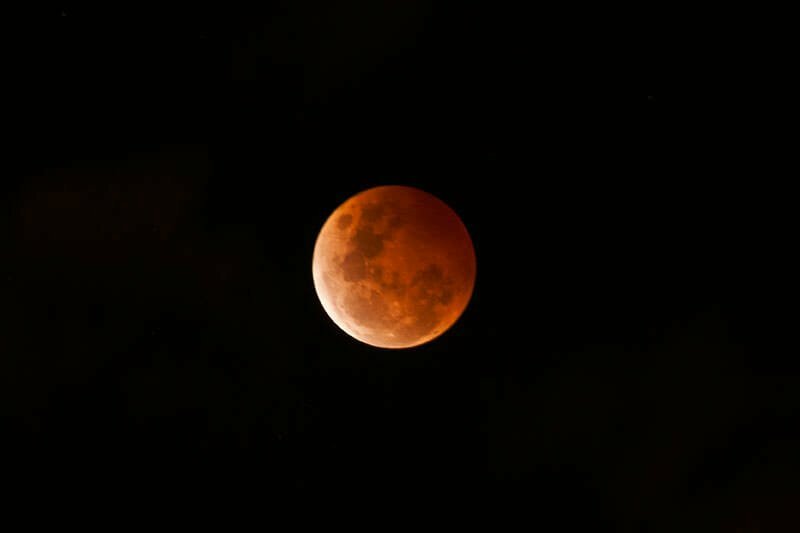 The eclipsed moon turned out to be an exceptionally good omen. For a while, we continued making our way downstream and then turned back hoping that the cat may have re-emerged. As we were travelling past the spot where we spotted it the first time Razmir suddenly cried, ‘Cat!’ I had the camera ready before he finished speaking. He had glimpsed the cat walking along the bank and disappearing behind a thick tree. We positioned the boat on the other side of the tree waiting for it to re-appear. When it didn’t, Razmir and I went for a walk on the bank, but the cat was long gone. The walk, however, gave me a chance to experience the softness of the jungle floor – something I could appreciate walking barefoot. Following the excitement of seeing the cat, we didn’t spot anything else and headed home. Until we ran out of petrol that is. We were about 3 km away from the camp when the engine coughed a couple of times and died. All I could do at this point was laugh. I had such an amazing night, that nothing could dampen my spirits. Razmir and the captain however were not as amused. To make things even more interesting we happened to be dead in the water in the spot with no mobile reception, so we couldn’t call for help. So rowing it was for the boys. I quite enjoyed the tranquillity of gliding along the river without the noise of the engine. I did however need to get back to wash my mud encrusted shoes and jeans so that I could wear them for the journey home the following day – Australian Customs are not particularly thrilled about exotic soil particles on travelers clothes. 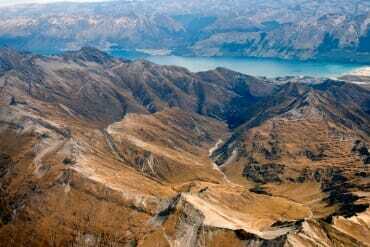 In the end Razmir did manage to send out an sms and shortly our rescue arrived and within 5 minutes we were home. The following morning Kinabatangan presented me with a parting gift. As the time of my imminent departure was approaching I went to have a shower and to pack up. Once everything was tucked away, camera dissembled and stored away I went back to the restaurant to have a quick lunch before leaving. And just as I sat down one of the staff spotted an Orangutan. In a frenzied rush stuff came out of the bag, camera was put back together and I ran for the final photo shoot of my Borneo adventure. A beautiful female Orangutan came right into the camp and remained in plain view for most of her visit. This was the closest I came to a wild Orangutan. She cruised through the canopy as we all watched her and took endless photographs. The perfect ending to a few amazing days of feeling truly alive.